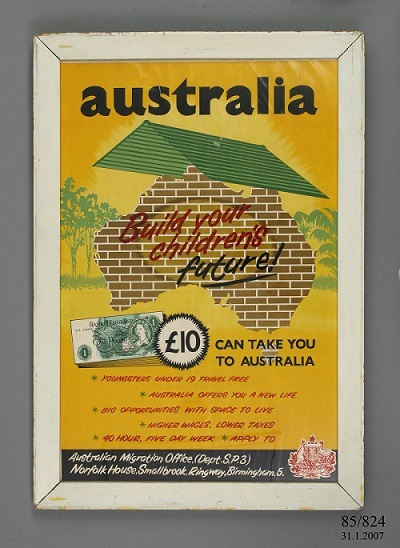 Life for migrants back in the 1940s, ‘50s and ‘6Os and earlier was much different to that of migrants of today. On our particular ship, the men and women were segregated for sleeping accommodation. My father and I were low down in the ship and up the front where we shared a cabin with perhaps a dozen or so other males all sleeping on bunk beds. My mother and my sisters shared a cabin with another woman and her daughter and their cabin was on a higher deck and much better furnished. We hit a little rough weather in the Bay of Biscay off the coast of France and Spain, then into the relative calmer seas of the Mediterranean to Port Said in Egypt. Whilst we were stopped at Port Said waiting to travel through the Suez Canal, Arab traders would come aboard to sale their wares to fellow travellers. We were not allowed ashore at Port Said, I guess because only twelve months earlier France and Britain had gone to war against Egypt over the Suez Canal and also Egypt was no longer considered British territory. The Arab traders that had come aboard had some unscrupulous people amongst them. Many migrants bought as souvenirs little stuffed camel shaped toys and foot stools only to find later that the toys and foot stools had been stuffed with used hospital bandages and the like. As for myself as a child I was a stamp collector and one trader was selling packets of Egyptian stamps. I bought one such package only to find that there were just a few stamps showing on the front of the package whilst the rest of the package was filled with pages from a newspaper. My father tracked down the trader and obtained a refund which turned out to be a useless mixture of foreign coins. Our next and only stop before sailing direct to Australia was Aden, which at that time was a British Protectorate and therefore we were allowed ashore (British flagged migrant ships such as the P & O and Orient Lines went on from Aden to Colombo, Ceylon, now Sri Lanka before travelling onto Australia). We wandered around the shops and town of Aden. Whilst walking around the town we saw a “Black Maria” Police wagon which had my mother frightened a little as she had acquired a cigarette lighter in the town in the shape of a pistol. The trip also introduced me to non-British food as the ship we were travelling on was an Italian vessel. As a child I certainly enjoyed the Italian Gelato for dessert as much as I had enjoyed the British Ice Cream I had left behind in England. SHARE YOUR MEMORIES AND OLD PHOTOGRAPHS WITH OUR “AS WE WERE” READERS. Memories of growing up locally, or when you moved into our community are welcome. Tell us your experiences from school days, sporting clubs, holidays, work or group organisations. If you have a funny or interesting neighbourhood storyies, we would like to publish them! Write to: 17 Rose St, Baulkham Hills, NSW, 2153. Email to ivorjones@hillstohawkesbury.com.au. Share on Hills District Memories at facebook.com/groups/Hills.memories or Hawkesbury Happenings & Memories at facebook.com/groups/ Hawkesmemories.